“You are my father”, sounds like a line out of Star Wars, but when I heard this from the mouth of Josselyn, it brought me to tears. In fact, it still does. Josselyn said this to me when I first met her. Many men are scared to death this scenario will happen to them (I’ll let you imagine the context), but to me it was one of the sweetest things I’ve ever heard. 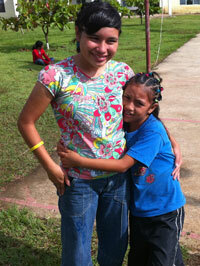 Tiffany and I had met Josselyn’s sister (Mabilia) three years earlier, on our first trip to Guatemala. We developed a relationship with Mabilia and began sponsoring her on a monthly basis. We love her and call her daughter. We knew she had a sister that was not living at the orphanage with Mabilia. She still lived with her mother; the same mother that Mabilia was rescued from. The day I met Josselyn, I had arrived at the orphanage with our team and was making my way around the grounds being received by the kids. I noticed Mabilia, as she approached me, with another girl. I hugged Mabilia, then turned to the girl. In her very broken English she uttered the words, “Papa Bryon, zshoo ah my fathuh and Tiffany eese my mutha”. I dropped to my knees, put my arms around her, and answered, “Yes. Yes I am. And you are my daughter”. I cried and held on to her as long as I could. Josselyn knew that she was loved by us before she ever met us. She knew it because she knew we loved her sister. She knew because God had placed her in a safe place with people that love her and take care of her. Josselyn is a happy girl, in a safe place. She knows her loving Savior and she shows His love to those around her. She’s beautiful and yes, she’s our daughter.